Santa Clara County: As I regularly do every year, I look at the evolution of real estate prices from month to month, and compare that with the year prior. We had a feeling in 2017 that prices were not slowing down during the usual slow periods of the year: in summer, and in winter. Well it shows clearly here that July and August did not go down in value (whether it is in average, or as a median price), and hardly came down in Nov. and Dec. This is to be compared with last year in 2018 which everyone identified as a "slower market": indeed, after May 2018 prices started to go down a bit, with a verifiable dip in July and August (showing a month later when properties close), a typical regain in activity in September, and then a continued soft market after that. The end of 2018 was definitely a good time to get in the market. February is showing us that, with the help of low mortgage interest rates, the market is picking up. Currently, these gentle interest rates along with a fairly low inventory of homes for sale contribute to a rise in prices - right on cue... statistically. Thinking of buying soon? Message me! 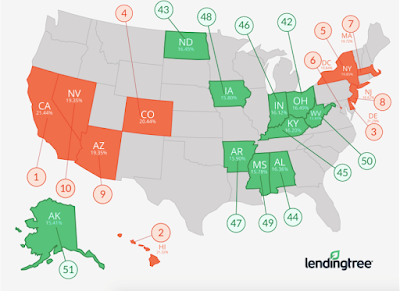 Advantages of a local lender, vs an online or out-of-the-area lender. - in any environment, competitive or not, it will be in your favor if the listing agent knows the lender too, and their track record. 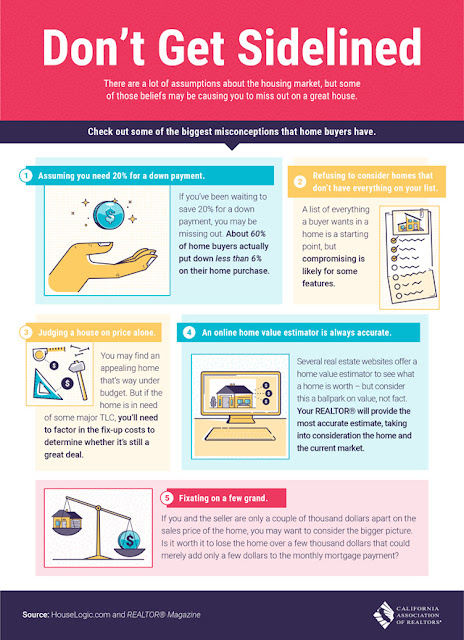 BTW, do you know that most people surveyed think that you need a 20% down payment to purchase a home, but that in fact the average down payment is 13% in the US, according to the National Association of Realtors? If you are thinking of a purchase I can give you names of proven local lenders. This is definitely the first step in your journey and I can help with it. I have already written a post about Tiny Homes, in the US and in particular here in the Bay Area of San Francisco. The concept and the idea is very appealing to the minimalist part of me that wants to get rid of unnecessary, costly material things. Here are a few more examples of Tiny Homes, as shown on the Dwell website. I believe there would be a large demand for small homes like these, located on small lots. The cost surely would be more accessible than the normal price of a small house on the traditional 5000 sq.ft piece of land, in our crowded local cities and counties. A lot of the value is in the land in the Bay Area, and with this type of arrangement you can envision a subdivision of many smaller lots, costing a fraction of the current prices. This other web page shows examples of Tiny Homes floor plans which could definitely be used elsewhere in small living spaces. Current mortgage rates Pretty good right now! California renters still want to own a home: four out of five renters state they want to own a home some day, and this is in spite of affordability challenges. Some of the statistics indicate that nearly half of renters say they would purchase a home if they got a new job, a raise, or a promotion, while another 40 % say they would be motivated to buy a home if they got married or were starting a family. Source: the 2018 California Association of Realtors Consumer Survey. Click on the image to read better. Thanks for reading, and sharing. estimated $2.5 million between the ages of 25 and 60. The study by the personal finance site Go Banking Rates (see the article by Gabriele Olya - June 6, 2018) looked at how much someone who starts paying rent at 25 would spend by ages 30, 40, 50 and 60 in America's 25 most populous cities. I like to put things in perspective: in real life most people would move at some point or other, relocate, change jobs or change their family situation. Purchasing a home is not always the best option: it depends on many factors - job stability, savings, goals in life, priorities, family situations etc... Still, the information is an important part of the equation when considering a home purchase. .... As is the current home ownership rate in the US: 64.4%. Any question regarding a real estate purchase or sale? Or trying to understand the parameters? Let me know! All Cash Deal - Time to Save on Title Insurance? One may think that Title Insurance is an unnecessary cost in a real estate transaction. After all, what can go wrong if you have excellent sellers' disclosures, and all looks so good and simple? Title Insurance is mandated by the bank when one has to finance the purchase. But it is not mandated when one buys cash: in that case, it is up to the buyer to request Title Insurance. There are many reasons why it is not a great idea to purchase without Title Insurance, and they are well summarized in this post from Cornerstone Title insurance. Getting Title Insurance is the only way you can have some vision on the history of the property, and whether or not it has liens or encumbrances. I also personally think it is a good idea (i.e. a very good idea) to talk to the Title company and ask questions about the preliminary title report and what it means exactly, when you are in contract to purchase a property. A worthy local non-profit to remember: Second Harvest Food Bank Santa Clara County. 7 Types of Lighting Fixtures. Light fixtures fascinate: when you go into a light fixture store, don't you want to buy them all? They radically change the room where they are installed, depending on the style, intensity, location. ..and how to arrange and design your inside lighting for a more gentle environment for your eyes. Beware! You will be tempted to spend money! Thanks for reading, and do not hesitate to contact me for your real estate questions. And Mississippi at 15.8% average DP, averaging $22.9k. This information is provided by the digital loan sourcing site LendingTree, and is reported by Alcynna Lloyd of HousingWire in her article dated Oct 26, 2018. As always, thank you for reading, and share if you like!